Select the type of feature story you’re writing about. There are different types such as: human interests; or a profile of an individual; instructional (how-to); historical; seasonal; etc. Use the old tried and tested formula of Who, What, Where, When, and Why. Tell us an interesting story while providing all of the essential information we need to know. Who are you, or the main focus of your article, what is the story about, where does it take place and within what time frame. Why is it compelling? Articles should be between 1 to 3 pages, double-spaced; 12-font in Times New Roman. Shorter or longer articles will be considered and articles will be edited if necessary. Articles that solve a problem or provide positive, inspirational information about the Black community, an individual, or organization will get publishing priority. You must include a jpg photo of author(s) and contact information including full name, title, institution where employed, phone # and email address. Additional jpg photos are welcome to help tell and visualize the story. You need to include a statement from author that the submission is his/her sole work and that the article has not been published elsewhere; and author owns copyright of article or has authority to grant Umoja the right to publish the article. Articles may be posted online for a month at the Publisher’s discretion, and then be posted in Umoja’s Archives indefinitely afterwards. Please submit articles by the 10th of the month. 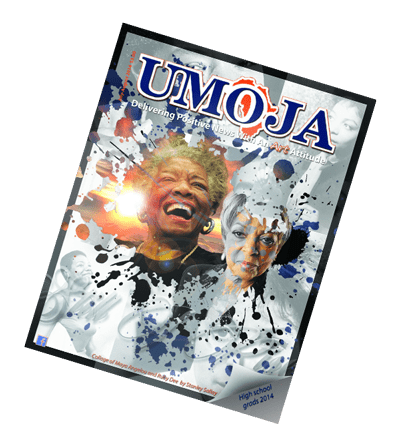 For example if you want your article to appear in the May issue of Umoja, we need it by April 10. We look forward to receiving your article. Publishing the article is considered compensation.